At work all we use is HP servers. It’s either DL or BL series… and anywhere from gen 6 to gen 10. 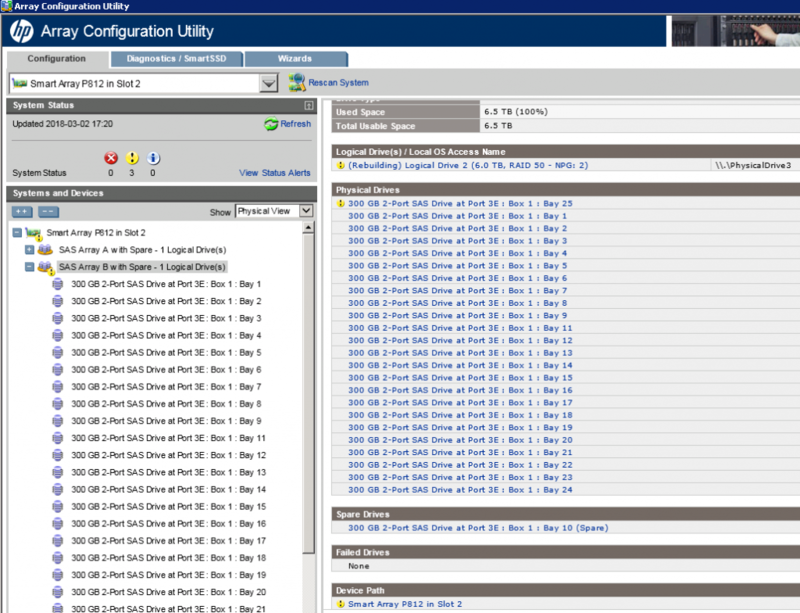 Recently one of our disk shelve StorageWorks D2700 had two HDDs detected as predictive failure. Predictive failure doesn’t make the drive slot amber so it’s difficult for remote hand to determine what to replace. Granted I could just give the HDD slot number and have remote hand replace the drives. It’s better to make the HDD slot blink so remote hand can be 100% sure what to replace. The two HDDs were located in RAID CTL slot #2 3E:1:10 and 3E:1:25. I made sure that both are actually failing first by checking the physical drive status. Launch HP Array Configuration Utility CLI and run following. Now I turn on blinking LED on both physical HDD caddy. Have remote hand locate the drives and replace them. Afterwards turn off the blinking lights. Once done ACU should be showing the array rebuilding.